Love never fails. But where there are prophecies, they will cease; where …there are tongues, they will be stilled; where there is knowledge, it will pass away. For we know in part and we prophesy in part, but when completeness comes, what is in part disappears. When I was a child, I talked like a child, I thought like a child, I reasoned like a child. When I became a man, I put the ways of childhood behind me. For now we see only a reflection as in a mirror; then we shall see face to face. Now I know in part; then I shall know fully, even as I am fully known. Fourteen years later, during his 1963 crusade, in Los Angeles, Billy called Stuart‘s conversion “the turning point” in the Billy Graham Evangelistic Association’s ministry. Billy added, before Stuart accepted Christ the crowds were rather small. It’s 16 degrees this mornin’ at my home. When I was fetched up (between Angleton and Danbury) the first thing on my mind on a morning like this was the livestock. Nothing’s changed, the livestock is still the first thing on my mind. If needed I will saddle up, but I hope it’s not needed! 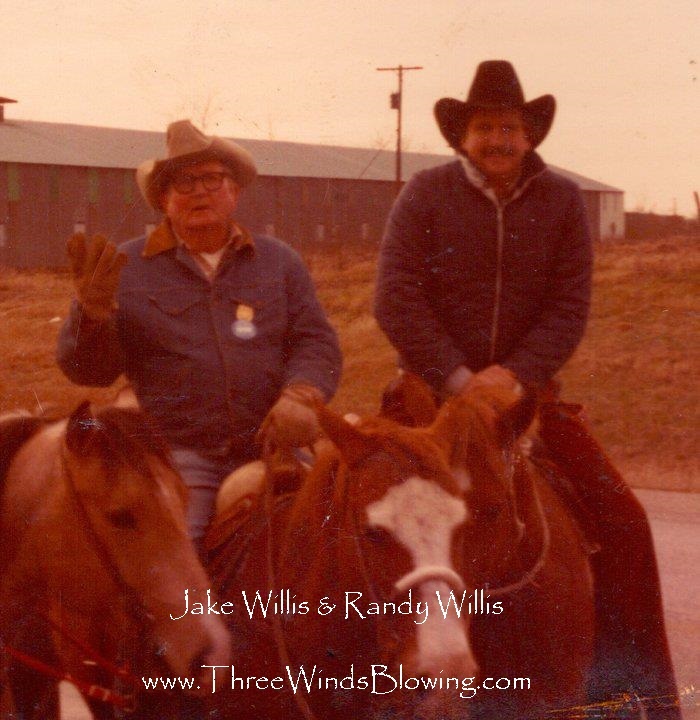 photo: My Dad Jake Willis and me. It was 17 on that morning.